All algorithms are run BOTH in the transmitters at the network edge AND/OR post-event on recorded footage. IndigoVision’s algorithms analyze live video and identify predetermined events of interest as they happen. Automatically-generated prompts lead to significant improvements in system effectiveness and improvements in incident detection hit rates. Huge productivity improvements and a boost for morale result from using Video Analytics during the searching of recorded material in post-event analysis. Changing the search variables at will allows the user to sift through vast quantities of recorded material quickly and efficiently. Analytics software then searches for the events requested, saving time and freeing the operator to concentrate on more immediate tasks. Congestion Detection is used to alert a user in the event of a build-up of congestion in an area of interest (railway station platforms, public spaces, highway entry/exit sliproads, point-of-sale queues, etc). This helps to initiate timely action and prevent an undesirable situation from worsening. It can also be used to provide statistics for staff planning and marketing purposes. For example, it can detect when a shopping mall is at its busiest, or when hypermarket queues start to build up. Motion detection can be used to alert users of unauthorized entry, for example, if a member of staff leaves by an unapproved exit. Users can define specific areas of interest in a scene and search automatically through a recording to identify and view any significant motion that occurred during the recording. This is hugely useful when searching for events in corridors, staircases, walkways, etc. during quiet times. It can be tuned using parameters such as object size and sensitivity. Used for alarm generation when an object has been left in a busy scene (such as a suitcase in an airport or railway station), this feature is a key component in the timely management of dangerous situations. This functionality can also be used to detect illegal parking, or vehicles staying too long in certain zones, etc. It can also be used to search recordings for events such as parking violations and blocked freeways. With a virtual tripwire set alongside a railway track, freeway hard shoulder, building perimeter or around a temporarily parked asset for example, the operator will be informed when that tripwire is breached. Since the system “understands” direction, alarm discrimination based on direction of approach is made possible. A virtual tripwire can also be placed on the entrance into a building or parking lot to review how many people or vehicles enter it. Shape-based detection/object tracking in analytics filters, such as virtual tripwire, can be used in many applications. 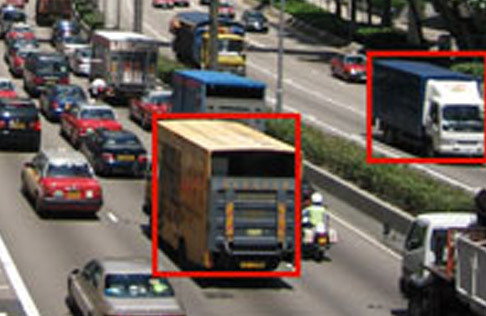 It can alert CCTV operators when a high-sided vehicle or ship approaches a low bridge. Alternatively, it can be used to distinguish between an animal approaching a boundary fence, and an intruder. In recorded video footage, this feature can be used to analyze the types of vehicles using a road, and what time of day they are using it. Museum mode can be used to detect theft, such as the removal of a painting from the wall of an art gallery. In this mode sensitivity is configurable and moving foreground objects are ignored. It can also be used when reviewing recording footage, for example, of a warehouse or a stockroom. It can quickly identify when a particular item was moved or removed from the scene.